What Is DA Form 7666? 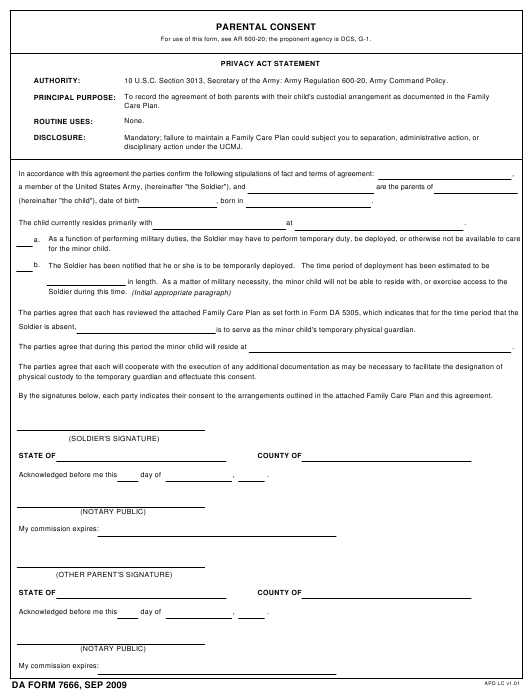 DA Form 7666, Parental Consent is a form used to obtain the agreement of both parents on the custodial arrangements expressed on their Family Care Plan. The form is a necessary part of the Family Care plan paperwork and allows a partner or other individual to act as temporary guardian of any dependents while the service member is performing their military duties. The newest version of the form - often incorrectly referred to as the DD Form 7666 - was released by the Department of the Army (DA) in September 2009. An up-to-date DA Form 7666 fillable version is available for digital filing and download below or can be supplied through the APD Forms website. The Family Care Plan - or FCP - is a tool used for designating a guardian that takes care of a service member's dependent child or children while they are away. The FCP is applicable only to single soldiers with kids, dual military members and parents with a separation agreement, not for soldiers married to civilians or soldiers without kids. How To Fill Out Da Form 7666? For use of this form, see AR 600-20; the proponent agency is DCS, G-1. 10 U.S.C. Section 3013, Secretary of the Army: Army Regulation 600-20, Army Command Policy. disciplinary action under the UCMJ. is to serve as the minor child's temporary physical guardian. physical custody to the temporary guardian and effectuate this consent. By the signatures below, each party indicates their consent to the arrangements outlined in the attached Family Care Plan and this agreement. First, the soldier has to enter their name in the first line of the form, then provide the name of the second parent, then the name of the child and their date and place of birth. The next several lines are meant for providing information on where and with whom the child currently primarily resides. Lines (a) and (b) provide information on the soldier's deployment period. The next line requires the name of the person who will serve as the child's temporary physical guardian while the soldier is performing their duties. The DA 7666 is then signed by the service member and certified by a notary public and then by the other parent, who must also have their signature notarized. DA Form 5305, Family Care Plan, is a form filed by soldiers seeking assistance with child care while they are on active duty trips. DA Form 5841, Power of Attorney, is a form used to designate a guardian for child care during a soldier's absence. DD Form 1172, Application for Uniformed Service Identification Cards/DEERS Enrollment, is a form used for enrolling in the Defense Enrollment Eligibility Reporting System for certain benefits and privileges. DD Form 2558, Authorization to Start, Stop, or Change Allotment, is a form used for maintaining a record of all allotments and ensuring that any starts, changes, and stops are in keeping with the wishes of the service member.